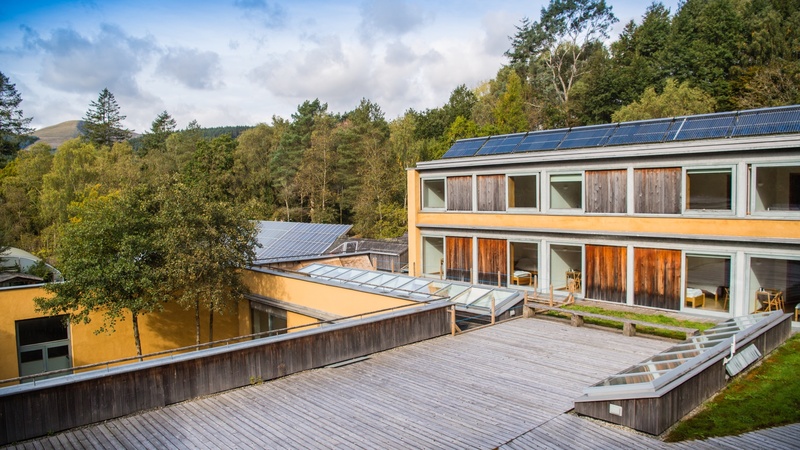 WISE, the Wales Institute for Sustainable Education, is a state of the art educational facility. 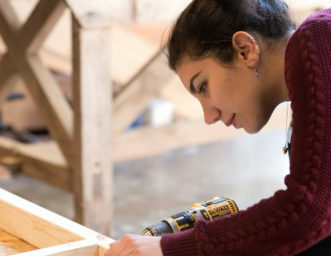 It is home to CAT’s postgraduate courses on renewable energy, building design and environmental sustainability. WISE also provides teaching and workshop spaces for our many short courses and educational workshops. Activities cover environmental building, renewable energy, ecology, water and sanitation, woodland skills and organic gardening. Other organisations or individuals can book parts of WISE for their own events, or just as overnight accommodation. The WISE building is designed to have a very low environmental impact in construction and in use. Throughout WISE we used natural materials with a low embodied energy – including timber, earth and hemp. 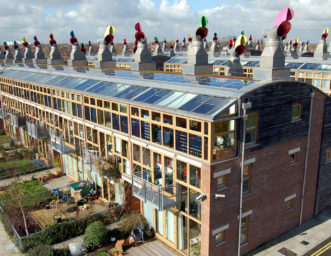 The embodied energy is the total energy used through extraction, transportation and manufacture. Harvesting and cutting wood to make our timber frame uses much less energy than mining and firing ore for a steel-framed building. Very high standards of insulation and air tightness were specified. 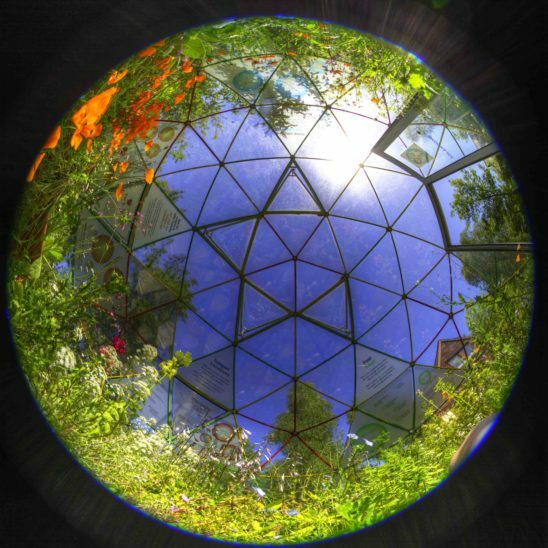 WISE has energy-efficient glazing to enhance natural daylighting and passive heat gain from the sun, so that the energy requirements are minimal. An array of solar water heating tubes on the roof produce hot water for the en-suite shower rooms. Additional hot water and space heating in winter comes from CAT’s wood-fuelled district heating system. Low grade slate bedrock from the CAT site provided sufficient loose aggregate fill to create a level site. The raft foundation had to be ordinary concrete reinforced with steel to achieve the required strength and stiffness – as did the raking foundations that went up the slate tip slope. Raft foundations have to be stiff enough to withstand some movement of the underlying ground and unreinforced concrete or limecrete would not have been suitable. We were able to drastically reduce embodied carbon emissions by substituting half of the Ordinary Portland Cement (OPC) with Ground Granulated Blast Furnace Slag (GGBS). This by-product of the iron and steel industry used to be considered waste, but is now quite common as a substitute aggregate. The plinth walls that support the timber frame were constructed using sand lime (calcium silicate) bricks. These are autoclaved (cured in pressurised steam), which uses much less energy than firing standard bricks. They are affected by moisture and will expand and contract very slightly. We incorporated carefully designed movement joints and used lime mortar to give the necessary flexibility. The brickwork cavity wall was filled with perlite insulation, with the top few inches mixed with limecrete to provide a cap. The limecrete mix used shale aggregate from Wenlock and sand from Condover Quarry (both in Shropshire), with St Astier lime. Ideally we would use recycled aggregate, but CAT is just too far from major built-up areas to currently be able to source them readily. The ground bearing slabs were constructed by laying hempcrete (see below) onto 200mm of bagged perlite insulation. We used a recycled polythene vapour control membrane and radon barrier. All the floors have a layer of Silencio Thermo grooved softboard to hold underfloor heating pipes. The floors are all finished with a proprietary floating floor using plywood and looselaid, secretly nailed, ash floorboard. 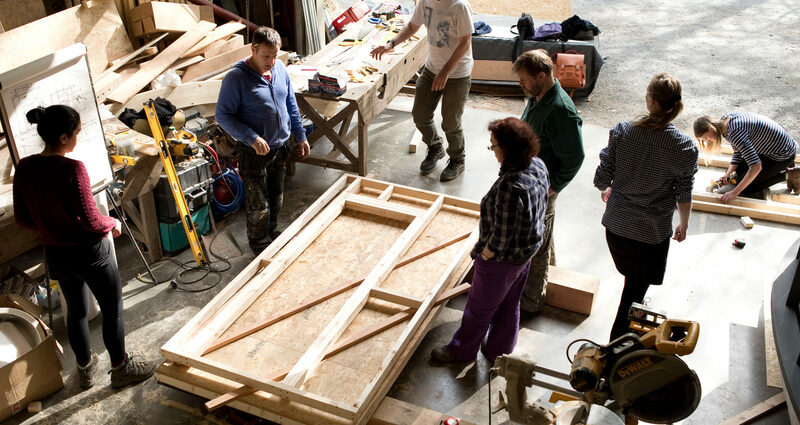 The frame uses FSC (Forest Stewardship Council) certified European whitewood glue-laminated (glulam) timbers, jointed with steel flitch plates. Due to the size and complexity of the frame we were unable to source it in Britain, and eventually settled on a Danish supplier. Glulam uses small sections of solid timber glued side by side and end to end, with staggered joints, to make large beams and columns that can carry high loads over long spans. Although the formaldehyde glue is not particularly eco friendly, only very small quantities are used. Steel or concrete beams use far more energy to manufacture than these glulam beams, and are also much heavier. The beams for the roof are FSC certified softwood timber. For the lengths and strengths needed, we did not need to use glulam. As such, this timber has a slightly lower environmental impact than that found in the main frame. 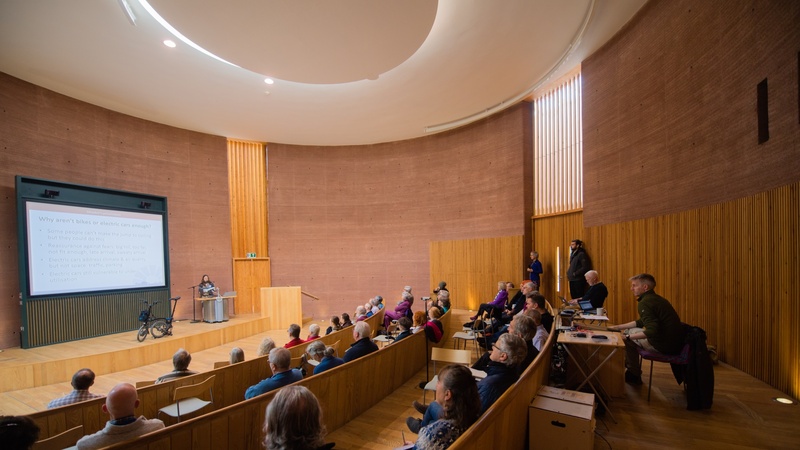 At 7.2 metres, the circular Sheppard Theatre has the highest rammed earth walls in the UK. Earth specialists Rowland Keable and Andy Simmonds were brought in to advise. 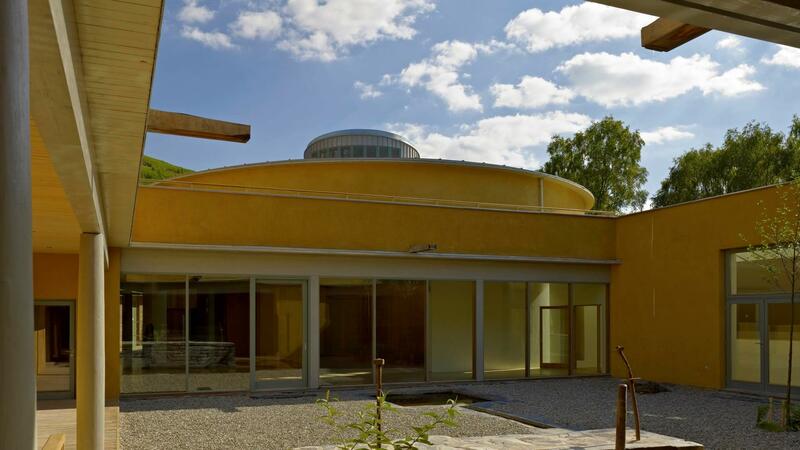 We built rammed earth walls for our Information Centre in 1999 using subsoil from Llynclys Quarry near Oswestry. We went to Llynclys again, tested some samples, and chose a waste product that had been processed to a suitable grading (with particles of 6mm and less). The shuttering for the theatre walls was a proprietary circular system with an adjustable radius. Workers compacted the earth in 100mm layers using a hand held pneumatic ram. The walls are 500mm thick, include 320 tonnes of earth, and support the roof. There’s a corridor around the theatre, between the rammed earth and the external walls. A large area of south-facing glazing allows the earth walls to soak up solar energy, particularly from the lower sun at cooler times of year. The earth walls prevent the building from overheating and buffer the temperature at colder times of the day by slowly releasing the captured heat. We used earth blocks for internal partition walls on the ground floor. These add thermal mass to the ground floor, give good sound insulation between teaching spaces and were easy to use for conventional workers. In the past, we’ve made blocks at CAT, but for WISE it was possible to buy them pre-made. We could have used a clay slurry to bed the blocks, but the contractor preferred a hydraulic lime & sand mortar. Once covered with a lime render, the blocks were strong and stable and there have been no shrinkage cracks. 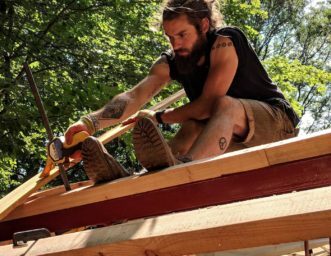 A hemp and lime composite forms most of the exterior walls of WISE, encasing the structural timber frame. Hempcrete walls give excellent insulation and air tightness, and their breathable, hygroscopic nature regulates humidity. The high thermal mass of hempcrete means it absorbs and stores heat, acting as a temperature buffer and reducing the need for artificial cooling. The walls are 500mm thick and have a U-value of about 0.14W/m2K. The lime binder, Tradical HB, was developed to use with hemp. It’s based on high purity air lime blended with other materials (including 15% cement). 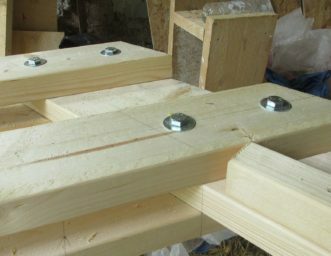 The binder and hemp fibres (shiv) were mixed dry, with water added as the material was sprayed into the formwork erected round the timber frame. This workers used an adapted concrete sprayer, as the technique is similar to casting concrete. A lime render provides the finish. Most of the roof is insulated with 450mm of cellulose (recycled paper), giving a U-value of 0.09W/m2K. This has a very low embodied energy compared to conventional fiberglass or plastic foam insulation. The terraced areas have 250mm of cork insulation under 150mm timber decking, giving a U-value of 0.14W/m2K. We also used cork in key places in the foundations to prevent cold bridging. We used Perlite insulation in some walls and ceilings, as well as under the ground floor slabs. Perlite is a volcanic rock that ‘puffs up’ when heated to high temperatures. The high performance double glazing uses a low-e coating, argon gas fill and insulated spacers in FSC-accredited redwood & oak frames, and has a U-value of 1.1 to 1.4 W/m2K. Windows in south-facing offices have sliding louvered screens help to prevent overheating in hot, sunny weather. The Sheppard Theatre roof is sheet stainless steel, made using mostly recycled steel. The manufacturing process is energy intensive but as steel is extremely durable it will have a long life and will always be recycled because of its high value. WISE has traditional fired clay pipes for ducts and drains, instead of PVC pipes. We avoided using PVC because it has a high embodied energy and causes other pollution problems during manufacture and disposal. To save energy the WISE design limits the use of mechanical ventilation and avoids air conditioning. Plenty of windows allow the simplest type of natural ventilation for much of the year. There are also many casement vents – incorporating a solid timber shutter, fly screen and external louvre. These keep out unwanted insects and driving rain, and remain secure when left open overnight. In WISE, night-time ventilation is particularly important in summer to allow the thermal mass in the building to cool down, so it can be a heat sink again the next day. The design uses passive stack ventilation principles to keep the building pleasantly cool in warmer weather. Vents have been positioned to allow a through draught from one side of a room to the other, and at high and low levels to create an up-draught of warm air. The bathrooms and toilets have mechanical ventilation using low power extraction and delivery fans to keep energy use down whilst delivering fresh air. The Sheppard theatre also uses mechanical ventilation to avoid becoming stuffy when filled with up to 200 people. Heat recovery technology reduces energy losses, by allowing incoming fresh air to be warmed by outgoing stale air using a heat exchanger. How are rammed earth walls constructed? To make rammed earth walls, loose, moist subsoil is compacted in thin layers between shuttering or formwork. The shuttering can be moved along or upwards as the wall is constructed. 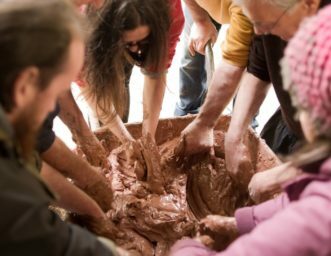 Mechanical compaction forces clay molecules to bond with the aggregate (a physical rather than a chemical bond), giving the wall its strength. Compaction is vigourous work and a powered hand-held tamper makes a big difference to the construction process. The pneumatic rammer used in the WISE rammed earth wall construction was a Trelawny VL compactor. Particle size and grading, moisture content, and clay content are all critical to the performance of the finished wall. Over a period of time, perhaps up to two years, a rammed earth wall will dry out and become as durable as sandstone, as long as it is waterproofed top and bottom. What is hempcrete or hemp & lime? When hemp ‘shiv’ (the inner core of the hemp) is mixed with a lime-based binder it forms a durable, insulating, reworkable and natural insulation material. It’s suitable for new builds and for renovation projects. As well as stopping heat loss and absorbing sound, it is porous and so is breathable – regulating moisture. The thermal conductivity (k-value) of hempcrete varies with the composition and density of the mix, but can be around around 0.06 to 0.11 W/m²K. 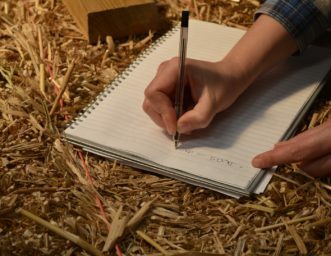 This value makes it similar to straw bale walls in terms of insulation for a given thickness. 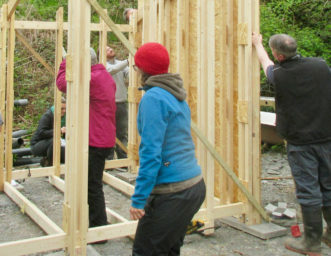 A timber frame construction could give the same insulation value with a thinner wall, but it would not have the ‘thermal mass’ that the hemp and lime wall has (the ability to absorb and store heat from both internal and external sources). A breathable lime binder is necessary. Although less energy is involved in the manufacture of lime compared to cement, it still has quite a high embodied energy. However, in the case of hempcrete, the hemp sequesters carbon as it grows, offsetting the carbon emissions produced by manufacturing lime. Hemp is easy to grow, increases local biodiversity and needs little or no fertilisers. Even intensively-grown hemp will sequester carbon, helping to offset that produced in manufacturing the lime. The microscopic holes in the hemp trap air so the dried hemp and lime mix is an insulator.